The Journey To Decaman - Beyond Exhaustion: The Psychological Battle may be over. Well the boy cracked a big, nay huge milestone this morning; 1000kms, hip hip, hoorah. 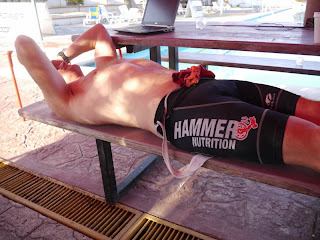 I decided that I would help, the last one Ironman a day boys to complete his marathon as he was really struggling, so I packed Simon of to our celubriious tent, whilst I ran with Enrique (no not Inglasias) to cover his last 24 kms. He had been struggling and looking as if he would not complete in the 24 hours, I got him there with an hour 20 to spare. During this jaunt Kale appeared on the track (runners runclockwise to the cyclist anti circuit, at least they see the same tarmac from a different direction), he looked shattered. So I decided not to tell Simon as I didn't think that Kale would be able to take many laps back, I was right on two fronts, not only was he riding slowly, but 'Sixth Sense Bourne, reappeared just after 6, and was zipping round the track in a flash. Which is why he now has over a THOUSAND kilometers ridden, only another 800 to go. The plan today is to consolidate, cover Kale's moves and hopefully, get some sleep. Some wisecracker moved Simon's socks just as I was taking the photo of him relaxing !!!! !